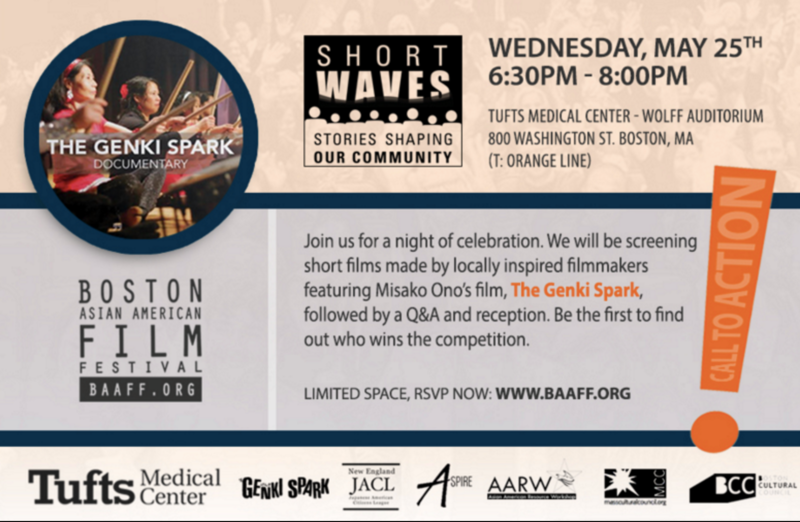 the Boston Asian American Film Festival will be featuring Misako Ono's film The Genki Spark Documentary as part of Short Waves! Stories Shaping Our Community. Misako Ono was a student in the Program for Narrative and Documentary Practice, as well as a TA the following year. She participated in two PNDP workshops, one in Dhaka, Bangladesh, and the other was the first Open Society Foundations workshop in Rio de Janeiro. Misako graduated last year and has been working in Copenhagen for a graphic design firm and pursuing independent documentary projects. The festival is co-sponsored by: New England Japanese American Citizen's League, ASPIRE, Tufts Medical Center, AARW, MA Cultural Council, and Boston Cultural Council.